It does not matter if the advertisement is online or not, the methods which people started to use about 120 years ago, are equally popular and effective now. Techniques as AIDA which is a very useful and successful model do not lose their relevance over the years. Conversely, with the speed of new technologies development, they modified and adapted to the modern reality. 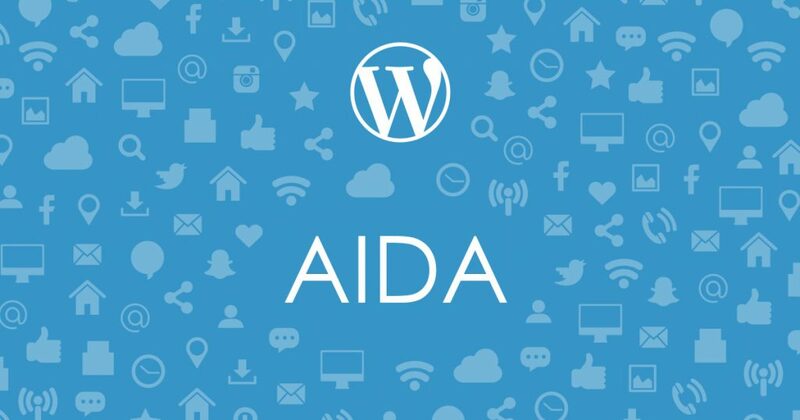 So, let's go through in order to understand what AIDA is and how it can be helpful in the case ads placed in WordPress websites. AIDA is an all-propose model of marketing which can be used by any type of business and advertisement. The title is an abbreviation from the words Attention, Interest, Desire and Action. That is the main elements of successful ads management. Take an advice, that each section of this model has to be done in a certain order. Start with the letter A which means Attention. AIDA encourages not to neglect the importance of attracting client's attention. The name, banners, images or etc - are the first impression which has to be exciting, bright and attractive. The main purpose is this: Minimal duration (about 5 seconds) - maximal efficiency. And as you can tell, the rule - "Don't judge a book by its cover" does not refer to this case. Next, you have to arouse interest. Of course, it is going to become more and more difficult to interest audience from year to year. Try to come up with something new and innovative, some special offer or show the benefits which clients will gain. Something which will awaken a desire to try, buy or get it! Desire is one of the most difficult stages in the model. It is a logical continuation of developing the interest. Here you have to show the product and the positive responses of users. Your honesty with clients surely will be appreciated. Only after the pass of these three stages, you can go to the stage of Action. It is not obligatory to purchase a product. Action implies that client may just visit or call to the shop, pass the registration on the website, leave an order or do something else. The goal is the start of interaction between client and your company. Digital "world" of advertisement is not an exception to the rules. All mentioned points are equally effective for the promotion of online ads. Particularly, in the case of WordPress websites, there are many useful and utility plugins which will help you to implement each stage of the model. As an example, to attract an attention, do not forget about the target audience's role, cause the attention you need is directly depending on them. Luckily, Aparg SmartAd ad management plugin has a really strong system of targeting the audience. By this simple but functional tool you may "set" the audience for each ad campaign (if it was interested, well then the article - "Targeting audience for your content and ads in WordPress blog" is obligatory to read!). Another usage of the same WordPress plugin for AIDA model can be the choice of maximally prosperous positions to place ads. Especially for an ad campaign, it is very important to be in the right place at the right time. Also, Aparg SmartAd has a large variety of animations and patterns for ad campaigns (just depends on the type of ad and your taste). You must agree, that nothing else can draw attention better. As every ad management technique, AIDA reaches its goals when you observe all "rules" and follows the progress of the process. So, especially for this part of the implementation, look at one more great feature of Aparg SmartAd plugin. This feature is a unreplaceable help in the form of serious statistical skill. Owning to dynamic stats option, you have a chance to follow every change related to single ads or huge ad campaigns. It is possible to trace positive or negative turn via a number of views and clicks. For more detailed data, it will be productive to select certain period and analyze it. By the way, you can export all stats to PDF file and use it out of the website. This kind of statistical information is not only a way to follow changes but also a good document for clients to prove the effectiveness of done work. So, the mix of an old technique and modern technologies is a really powerful tool. And ease on availability!